Olympus is a modern, beachfront villa with full air-conditioning and an enviable location near Rum Point Beach. Rum Point is a hot spot for Cayman travelers, with restaurants and a gorgeous beach at the tip of the peninsula. If you want to swim in the sea, step outside your back door! If you want to party all night, follow the staircase up to the rooftop deck! If you want to relax, wander out to the poolside deck and sink into a lounger! There’s something for everyone at Olympus, all with privacy guaranteed. Gorgeous villa located on an elevated ridge! 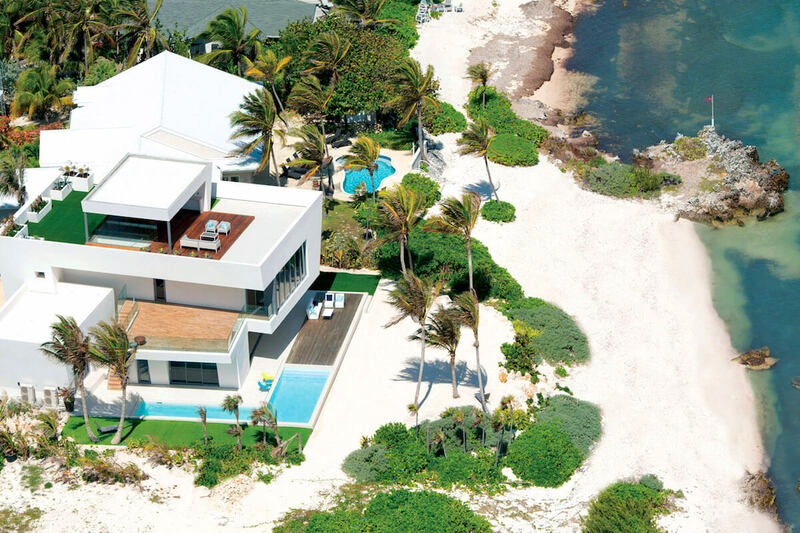 Olympus is an private, modern villa rental perched on an oceanfront ridge in Rum Point. This two-level home has a large rooftop deck, full air-conditioning, and is near Rum Point Club. The beach is in Olympus’ backyard, just beyond the wood deck and L-shaped pool. Rum Point is known for great snorkeling, and Olympus has a sandy area where swimmers can easily enter the sea. There’s a lawn on either side of the house, surrounded by tropical landscaping to enhance Rum Point’s natural beauty. On the ground level, the outdoor living area has plush couches to relax in and a pool with ocean views. Follow a flight of stairs up to the second level, which has a vast wooden deck for yoga practices, watching the sunset, or laying out. A glass-railed staircase leads to the rooftop deck with 360º views. Relax on the sofas, chairs, and chaise lounges; or hang out in the roofed entertainment area around the shaded dining table, outdoor kitchen, and prep area with a propane grill. On the first floor, guests will find a grand entryway, contemporary design, and views of the pool and ocean. The hallway leads to the Great Room, which incorporates the kitchen, dining area, and living room. The gourmet kitchen has stone quartz counters, state-of-the-art appliances, and ample space for guests to cook together. Enjoy meals at the breakfast counter or dining table, then move into the living room or step outside to the pool deck. A powder room and a full laundry room sit nearby. This level holds the queen suite, which has a wall of sliding glass doors that open to the pool. Guests can relax by watching TV, preparing drinks at the kitchenette, or laying in bed to stare at the sea. A floating staircase in the entryway leads up to the second level, which holds three bedrooms and two terraces. The south king suite opens to the glass-railed west terrace, with unobstructed sea views. This suite has a luxurious ensuite bathroom, vanity, large closet, and a flatscreen Apple TV. The north king suite has floor-to-ceiling glass with 180º views, and opens to both the east and west terraces. Guests can enjoy the overstuffed reading chair, an ensuite bathroom with a bathtub and shower, a large walk-in closet, and the flatscreen Apple TV. The fourth bedroom, a queen suite, opens to the west terrace and has an ensuite bathroom and Apple TV. Glass-railed stairs lead up to the rooftop deck, which has a garden, outdoor kitchen, and entertaining space. Olympus is a few minutes from Rum Point Beach, which offers restaurants and water sports. This region is far enough from the busier Seven Mile Beach to guarantee peace and privacy, so Olympus is perfect for travelers who want total relaxation. Sandy water entrance for swimming, but water shoes are recommended. Rum Point Beach is an approximate 3 minute drive. A refundable damage deposit/excess cleaning fee of $2,500 will be charged at final payment, and refunded within 10 days of departure, barring no damages, excess cleaning or incidentals. Car rental, private chef, butler, server, daily maid service, grocery and beverage shopping (pre-arrival and during your stay), liquor and wine delivery, nanny service, additional baby equipment, spa services, yoga and personal training, photography, and private airport transfer/car service can be arranged for an additional fee. It’s hard not to say “wow” when entering this villa, and our jaws hit the floor when we walked into the master suite. Every detail is first class. If you are looking for Rum Point luxury, book this place and start packing! What an amazing home and property. The owner has really put thought into the house, the amenities and the overall property. The bad news is that the internet is not very stable so nighttime relaxation sometimes needs to be movies or other things that the owner has left for renters to use. The other bad news is that the beach is a coral-based beach, so bring your swim shoes. Everything else is top-notch, including the property managers, the pool, the weather, the house, and the hammocks out back. This place will drain your stress quickly and make you not want to leave. We’re planning on going back next year!!! This was our second experience with WhereToStay and we could not be happier. Sharon was as easy to work with as Andrew was the year prior. I reference this website to everyone I speak to who’s looking for an exceptional home in the islands that is far and above anything elsewhere. These homes are all top notch!! !